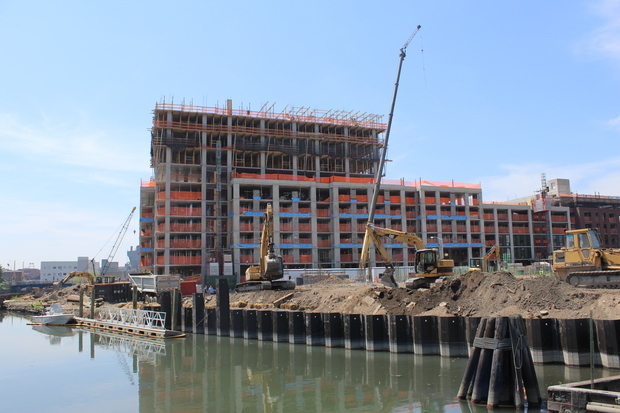 GOWANUS — Environmental watchdogs say a developer illegally dumped dirty water into the Gowanus Canal and they've asked state authorities to investigate. 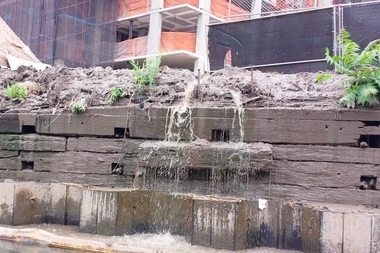 The environmental group Riverkeeper spotted muddy water spilling into the canal from the construction site July 2 where the Lightstone Group is building a 700-unit "luxury rental community." Riverkeeper's John Lipscomb saw the spill from his Riverkeeper patrol boat and, though he couldn't tell how serious the leak was or whether the water contained pollutants, he reported it immediately to the state Department of Environmental Conservation. "On the scale of horrors that have been perpetrated against the Gowanus, this is nothing,” Lipscomb said, referring to the canal's past as a dumping ground for toxic waste. “But in a place that’s been beat, more beating isn’t OK. We would love to protect it from any new insults." Riverkeeper speculated in a blog post that the spillage appeared to be an ongoing problem, but a representative for Lightstone said it was an isolated event that's since been corrected. Lightstone spokesman Ethan Geto blamed a leaky fire hydrant on the construction site for causing the overflow of muddy water into the canal. A similar spill happened last fall and, after consulting with DEC, Lightstone built a basin to catch water and keep it out of the canal. The basin gradually filled up and overflowed last week, Geto said. The leaking water was from the city's water system and was used on the site for construction purposes, Geto said. “It’s a one-time incident and it won’t happen again,” Geto said. “The water source itself wasn’t toxic or dangerous or anything." The Department of Environmental Conservation did not immediately respond to a request for comment. Riverkeeper's Lipscomb said even if the spilled water didn't contain pollutants, letting muddy water flow into the canal is a violation of the Clean Water Act. But Riverkeeper won't "pick a fight" over the spill, he said. In the past Riverkeeper has threatened legal action against suspected polluters and won a major victory in 2011 when a Gowanus bus company was fined almost $500,000 for dumping oil, concrete and garbage into the canal. Lightstone finished the first phase of its apartment complex in May and is expected to complete the site for occupancy in early 2016. The development is perched on the edge of the heavily polluted canal and Lightstone has agreed to do $20 million of environmental cleanup work in the area. The canal is a Superfund site and the U.S. Environmental Protection Agency is expected to start work in 2017 on a $500 million cleanup.